So, one day my husband called me asking if we had enough ingredients at home to make something... that's all, make something. What that something is I have no idea! It turned out that at work they all decided to bring in foods to snack on throughout the next day because they'd been so busy. Did he want some kind of dip, a dessert, a side dish? I had no idea. The only thing I KNEW I had the ingredients to make would have been chocolate chip cookies.... well, as I was on the phone with him someone signed up to take cookies so that was out. I didn't get to try any of these but apparently they were great. There are a few things I'll do differently when I make them but I'll definitely make them again! - Preheat oven to 350° F.
- Place one vanilla wafer, flat-side down, on bottom of each cup. Place 5 to 6 morsels on top of each wafer. - Beat cream cheese, sugar and flour in large mixer bowl until creamy. - Add eggs and vanilla extract; beat well. 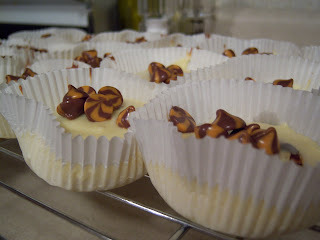 - Spoon heaping tablespoon of cream cheese mixture into each bake cup. - Bake for 15 to 17 minutes or until just set and not browned. Remove from oven to wire rack. 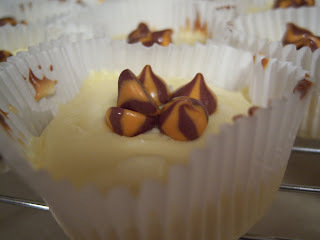 - While still warm, top cheesecakes with remaining morsels. Morsels will soften but will retain shape.